Secretary of State says downing of Russian warplane underscores an urgent need to resolve the Syria conflict. 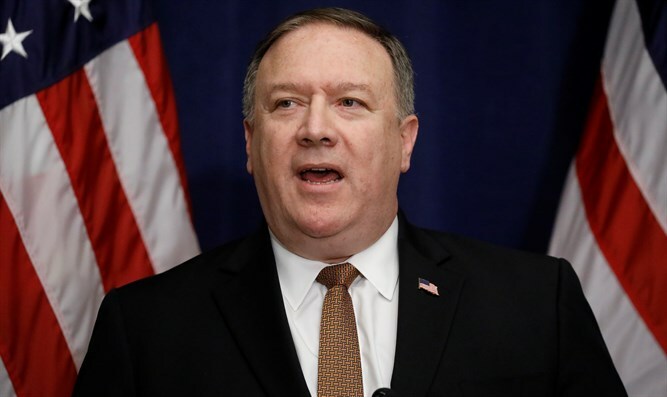 US Secretary of State Mike Pompeo on Tuesday expressed sorrow for the downing by Syria of a Russian warplane with 15 people on board, saying it underscored an urgent need to resolve the Syria conflict. "The United States expresses sorrow for the death of the aircrew members of the Russian plane that was downed by Syrian regime anti-aircraft fire," Pompeo said in a statement quoted by AFP. The incident "reminds us of the need to find permanent, peaceful, and political resolutions to the many overlapping conflicts in the region and the danger of tragic miscalculation in Syria's crowded theater of operations," added Pompeo. The Russian Ilyushin-20 surveillance plane was downed off the Syria coast late Monday. The Russian Defense Ministry earlier on Tuesday blamed Israel for the downing of the plane. The IDF denied Russia’s claims, saying Syrian anti-air missiles fired after an Israeli airstrike in northern Syria struck the Russian plane, destroying it. Russian President Vladimir Putin later said that the downing of the aircraft was the result of a “chain of tragic circumstances”. Prime Minister Binyamin Netanyahu subsequently spoke on the phone with Putin and expressed regret for the death of the crew members of the plane. Netanyahu told Putin Syria was responsible for shooting down the Russian aircraft. In his statement, Pompeo added that the shoot-down underlined the "urgent need to resolve the Syrian conflict" in accordance with UN resolutions and "to end Iran's provocative transit of dangerous weapon systems through Syria, which are a threat to the region." “We have done a tremendous job in Syria and in that region eradicating ISIS, which is why we are there. And we are very close to finishing that job,” he added.